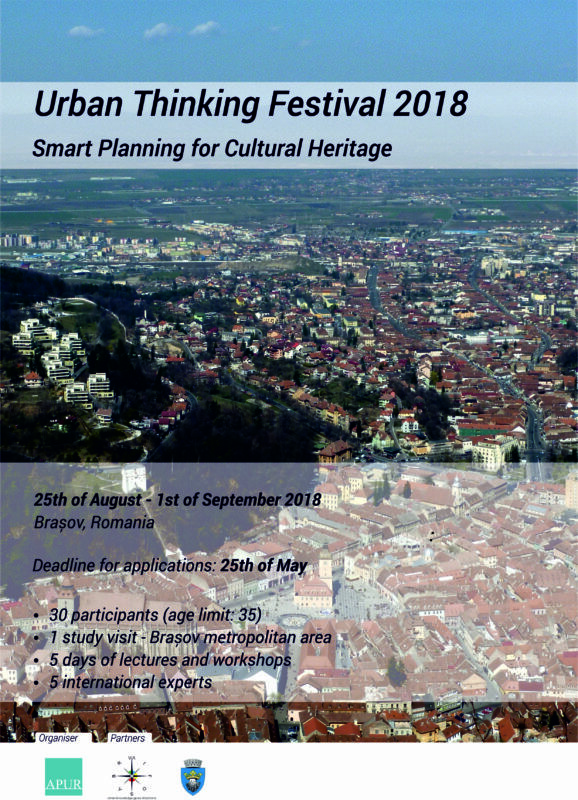 The Romanian Professional Association of Urban Planners (APUR), together with Urbasofia SRL and the ISOCARP ND Romania, organise the first international Urban Thinking Festival with the theme on Smart Planning for Cultural Heritage, as close to other events related to the European Year of Cultural Heritage – 2018. The Urban Thinking Festival aims at proposing, by the work of selected students and young professionals, invited international experts and capitalising on existing local knowledge, new methodologies for tackling planning for cultural heritage in small and middle-sized cities. There are two main outputs of the festival: 1) a manifesto for smart planning, including possible approaches and methods for developing cities based on cultural heritage, and 2) a spatial cultural concept for the host city, that can be detailed in subsequent projects to improve the city’s image related to the conservation and capitalisation of its cultural heritage. We expect a group composed of 30 young professionals participating in the Urban Thinking Festival, along with 5 international experts, 6 urban planning professionals from the organising institutions (facilitators), local experts and other invited guests. The festival will take place between the August 25 and September 1, 2018, in the city of Brașov in Romania – a former medieval city of Transilvania and one of the country’s most important economic centres, now facing multiple challenges related to its economic development, metropolitan growth and the necessity to conserve its significant cultural heritage. One-day study visit to a Romanian city with significant cultural background, facilitated by local and international planning experts (August 26). Each working day is followed by an informal round table with the invited international and other local experts (planners, public administration, NGOs) discussing different topics related to cultural heritage issues. The round table session is open to public. Artistic events, as well as informal debate sessions are scheduled for evenings. Besides access to the above-mentioned activities, the attendance fee for students will also cover the welcome reception (on Saturday, August 25, 2018), a welcome pack, as well as lunch breaks and coffee breaks for the five working days. Transportation and accommodation costs will have to be covered by the participants. We encourage applications from master degree students, PhD students or young professionals (age limit: 35 years) with the interest in the domains of urban planning, architecture, cultural heritage, tourism or technology/smart cities. We consider interdisciplinarity a key to providing quality expertise in the cultural heritage related issues, so we also encourage professionals from a wide range of domains (architecture, urban planning, history, geography, economy, sociology, IT, engineering, etc.) to apply.